News Trader Pro, our auto-click news trading software was developed on the back of over a decade of experience trading on a professional trading floor. The best kept secret is that professionals make over 90% of their profit on news driven events! When analysts get their forecasts wrong, the market has to quickly re-price the new information. News Trader Pro gives you the tools to do just that. Getting the news when you need it is expensive. Bloomberg alone costs over $1,000 a month. News Trader Pro brings you the market moving news, the instant it happens at a much more reasonable price. We developed the news trading software to bridge the gap between analysis and execution. It auto-clicks on your pre-defined triggers as soon as the news hits the wires. Compatible with every Forex, Futures and Binary Options platform. Pre-release analysis for each of the week’s top figures. Live Triggers. 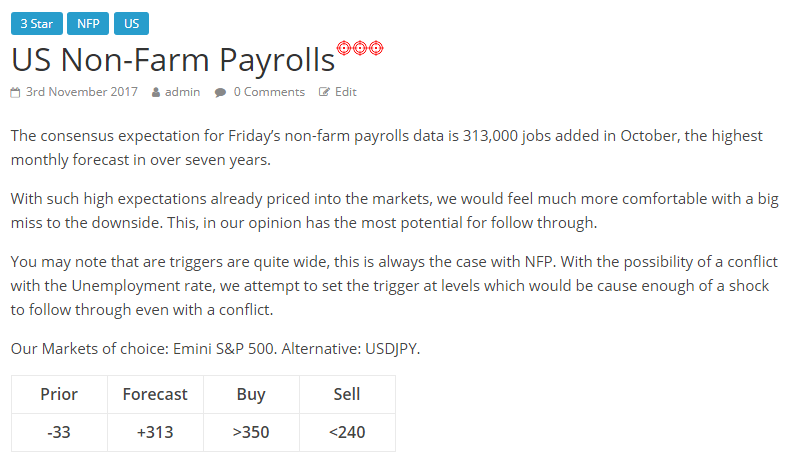 The exact News Trader Pro triggers that we’ll use to trade. Post analysis. Why the market reacted the way it did and how we traded it. Through our analysis we teach you everything we’ve learnt in over a decade of trading the news. As an added benefit of subscribing, you get a free affiliate account. We’re sure you know others who could profit with News Trader Pro. Refer them, and we’ll give you 20% of their subscription for as long as they’re a subscriber.